Does your kitchen look a bit withered, worn-out, and outdated? Are you worried that you might need to shell out thousands of bucks to give it a complete makeover? Well, here’s some good news. With just a little amount of creativity, inspiration, and research, you can give a whole new look to the heart of your home. How? Check out these 10 kitchen decorating ideas on a budget that shall help you in transforming the existing scheme of your cooking space. One of the best cheap kitchen decor ideas is to apply a new coat of paint over your furniture, walls, and cabinets. Get hold of a can of satin or semigloss latex paint and start painting your walls. These types of paints are more resistant to scrubbing and moisture absorption. You can also go for an accent wall — coloring it a shade darker than the existing shade in the rest of the kitchen. Another of the clever small kitchen decorating ideas is to paint your kitchen cabinets, instead of buying new cabinetry. Some great color options for cabinet doors are yellow, lime green, and orange. Choose from the latest range available in the market and be sure to apply a primer before applying the paint. If you want to go for a bolder look, check the image above. See how the combination of metallic and cherry red color palettes transforms this kitchen into a bright, peppy, visually appealing area. Fresh greenery can add life and natural colors to a plain kitchen. Bring in a few potted plants and hang them from the ceiling in the bare corners of the room. Place some fresh flowers or leaves over easily reachable areas such as the island top, window sills, or open shelves. They give a soft, breezy feel to your cooking space. If you don’t have the time to care for real plants, go for realistic, silk ones. Hanging brand new drapes is one of the easiest kitchen decorating ideas on a budget. Window treatments can really spruce up your space. However, be careful when you choose the fabric as it should not be ruined by water splashes. Washable fabric, Roman shades, valances, window toppers, and stationary shades are wonderful choices for window treatments — which can add color and brightness to your kitchen. 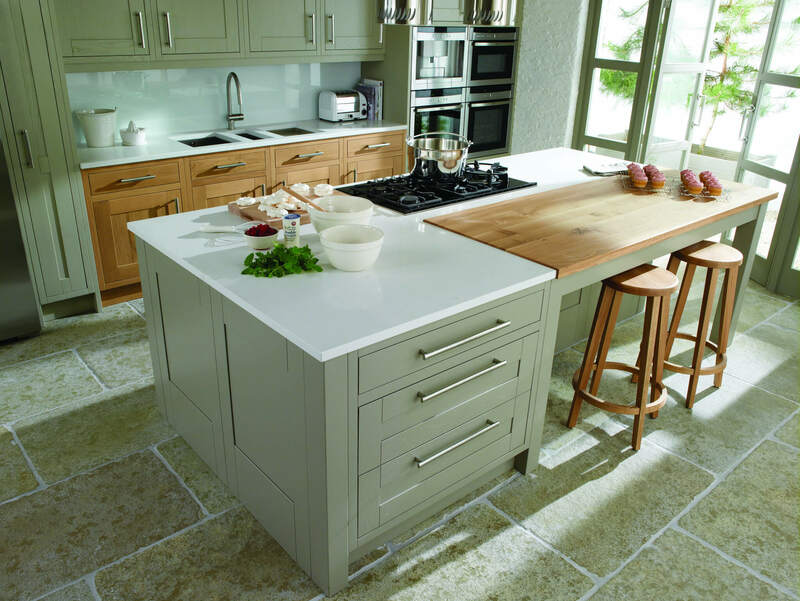 It’s a common belief that kitchen islands take up huge space. However, you can enjoy the benefits of this versatile work center by utilizing minimal square footage as well. Look for an old table or dresser. Now, add a new countertop, hardware, and few hooks. There! You have it. A useful, multipurpose, freestanding storage area. Place a few stools below the island and you can use this area for preparing food and hosting dinner parties as well. A twist in the arrangement of your accessories can transform your kitchen from drab to dashing! Think about a theme by means of which you can give a completely new look to the area by just changing a few items — such as toaster covers, dish towels, canister sets, salt and pepper shakers, cutting boards, pot holders, and utensils. Changing a simple thing such as cabinet pulls can give a whole new dimension to your kitchen. There is a gamut of styles of cabinet pulls in the market nowadays such as figurative, wooden, ceramic, and glass. Get a design that complements the rest of your decor. With a bit of practice, you can install them yourself and it will seem as if you have got new cabinets! Wallpapers are one of the best kitchen decorating ideas on a budget and they are an easier alternative to paints. They add color and interest to the entire space. You can put up wallpapers anywhere — such as the top of the wall or beneath the cabinets. We would recommend you to cover only the main wall and let the other parts be bare — in order to allow the covered area to act as the main focal point for the kitchen. Lighter shades — as compared to darker shades — give the impression that your kitchen is spacious. If you have open cabinets, you can consider wallpapering the walls behind the cabinet. This will enhance the look of your displayed Chinaware. Throwing in a carpet is another of our favorite kitchen decorating ideas on a budget. Cover the floor space in your kitchen with matching rugs. They offer comfort to your feet and are pleasing to the eyes. Area rugs can add pops of color or conceal a part of the floor that is worn out or does not match with the rest of the room. If your countertops have become old and dull, try installing a stylish laminate over them. Laminates imitate the sophisticated look of granite, marble, or soapstone. They come in a wide variety of shades, textures and patterns, are cheap, easy to maintain and clean. You can even top your counter with a butcher block — which removes the need for a separate cutting board. Take the help of a designer in order to get inspiration for creative lighting ideas for your kitchen. Depending on the existing scheme, you can hang some dramatic lights from the ceiling. Many homeowners go for over-sized metal pendants. This category of statement lighting adds an industrial feel to your kitchen. You can fix them above a table or island — to give that area the appearance of a focal point. If your kitchen is small, you can hang lights in sets of twos or threes — so that they don’t look crowded. So here you go! These 10 kitchen decorating ideas on a budget are proof enough that you don’t always need to empty your bank balance for that perfect overhaul.